Yesterday morning as I waited in the foyer of an assisted living facility, I glanced at a basket filled with old magazines. The magazine on top of the pile was the AARP magazine. I am not an “AARP guy,” but the cover picture was a picture of a smiling Ramón Antonio Gerardo Estévez, better known by his stage name, Martin Sheen and the feature story in this issue [July/August 2008] was billed on the cover as “The Completely Outrageous Passion of Martin Sheen.” If I had seen the same issue when it was first published nearly five years ago, I would have ignored it. I have not always been a Martin Sheen fan. I was first introduced to Martin Sheen when I was assigned to write a film review on “Apocalypse Now” when it opened in Utica, NY in early 1980 [it took a while for films to get to Utica 30+ years ago]. I don’t recall being overwhelmed by Mr. Sheen’s performance, probably because I didn’t particularly care for his character, Capt. Benjamin Willard. Thirty years ago, I practiced patriotic idolatry, and I more closely identified with Robert Duvall’s character, Lt. Col. William “Bill” Kilgore and his “Kill-a-Commie-for-Christ” leadership style. Last year, Mr. Sheen grabbed me by the heart when I watched his son’s 2010 film “The Way.” Martin Sheen’s performance inspired me to learn more about the man, and the more I learned, the more humbled I became. Martin Sheen is the real deal. So today, when no one was looking, I snatched the old AARP issue and carried it home. Mr. Sheen sets an example of total commitment to his family and unmatched fearlessness in helping his son. His example deserves you attention. I was so moved by this five-year old article written by AARP, The Magazine Editor-in-Chief Nancy Perry Graham, that I am posting it here as a PDF document. Please take the time to read it. Well, as God would have it, the old copy of AARP met your line of vision, you were captured and took it home. I thank you for posting the whole article ! 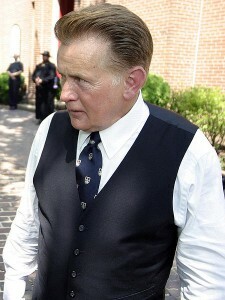 I too am now “converted” to much respect for Martin Sheen and compassion for his son. We never really know a person until we know them as God does. And hasn’t God given to each of us what Martin gave to his son, total commitment of love, a covenant, never to be broken. You “did a good thing” Gene.